1 O God, Thou hast cast us off, hast broken us, Hast been angry with us--restore us again. 2 Thou hast shaken the land, hast rent it-- Heal its breaches, for it trembles. 3 Thou hast made Thy people see hard things, Thou hast given them to drink reeling as wine. 4 Thou hast given a banner to them that fear Thee, [Only] that they may flee before the bow. Selah. 5 That Thy beloved ones may be delivered, Save with Thy right hand, and answer us. 6 God has spoken in His holiness,--I will exult: I will divide Shechem, and measure out the valley of Succoth. 7 Mine is Gilead, and mine Manasseh, And Ephraim is the strength of my head, Judah, my baton of command. 8 Moab is my wash basin, Upon Edom will I throw my shoe, Because of me, Philistia, shout aloud. 9 Who will bring me into the fenced city? Who has guided me into Edom? 10 Hast not Thou, O God, cast us off? And goest not out, O God, with our hosts. 11 Give us help from the oppressor For vain is help of man. 12 In God we shall do prowess: And He, He will tread down our oppressors. This psalm has evidently a definite historical background. Israel has been worsted in fight, but still continues its campaign against Edom. Meditating on God's promises, the psalmist anticipates victory, which will cover defeat and perfect partial successes, and seeks to breathe his own spirit of confidence into the ranks of his countrymen. But the circumstances answering to those required by the psalm are hard to find. The date assigned by the superscription cannot be called satisfactory; for David's war there referred to (2 Sam. viii.) had no such stunning defeats as are here lamented. The Divine Oracle, of which the substance is given in the central part of the psalm, affords but dubious indications of date. At first sight it seems to imply the union of all the tribes in one kingdom, and therefore to favour the Davidic authorship. But it may be a question whether the united Israel of the Oracle is fact or prophecy. To one school of commentators, the mention of Ephraim in conjunction with Judah is token that the psalm is prior to the great revolt; to another, it is proof positive that the date is after the destruction of the northern kingdom. The Maccabean date is favoured by Olshausen, Hitzig, and Cheyne among moderns; but, apart from other objections, the reappearance of vv. 5-12 in Psalm cviii. implies that this piece of Hebrew psalmody was already venerable when a later compiler wove part of it into that psalm. On the whole, the Davidic authorship is possible, though clogged with the difficulty already mentioned. But the safest conclusion seems to be Baethgen's modest one, which contrasts strongly with the confident assertions of some other critics--namely, that assured certainty in dating the psalm "is no longer possible." It falls into three parts of four verses each, of which the first (vv. 1-4) is complaint of defeat and prayer for help; the second (vv. 5-8), a Divine Oracle assuring victory; and the third (vv. 9-12), the flash of fresh hope kindled by that God's-word. The first part blends complaint and prayer in the first pair of verses, in each of which there is, first, a description of the desperate state of Israel, and then a cry for help. The nation is broken, as a wall is broken down, or as an army whose ordered ranks are shattered and scattered. Some crushing defeat is meant, which in ver. 2 is further described as an earthquake. The land trembles, and then gapes in hideous clefts, and houses become gaunt ruins. The state is disorganised as in consequence of defeat. It is an unpoetical mixture of fact and figure to see in the "rending" of the land allusion to the separation of the kingdoms, especially as that was not the result of defeat. There is almost a tone of wonder in the designation of Israel as "Thy people," so sadly does the fate meted out to them contrast with their name. Stranger still and more anomalous is it, that, as ver. 3 b laments, God's own hand has commended such a chalice to their lips as should fill them with infatuation. The construction "wine of reeling" is grammatically impossible, and the best explanation of the phrase regards the nouns as in apposition--"wine which is reeling," or "reeling as wine." The meaning is that God not only sent the disaster which had shaken the nation like an earthquake, but had sent, too, the presumptuous self-confidence which had led to it. Ver. 4 has received two opposite interpretations, being taken by some as a prolongation of the tone of lament over disaster, and by others as commemoration of God's help. The latter meaning violently interrupts the continuity of thought. "The only natural view is that which sees" in ver. 4 "a continuation of the description of calamity" in ver. 3 (Cheyne, in loc.). Taking this view, we render the second clause as above. The word translated "that they may flee" may indeed mean to lift themselves up, in the sense of gathering round a standard, but the remainder of the clause cannot be taken as meaning "because of the truth," since the preposition here used never means "because of." It is best taken here as from before. The word variously rendered bow and truth is difficult. It occurs again in Prov. xxii. 21, and is there parallel with "truth" or faithfulness in fulfilling Divine promises. But that meaning would be inappropriate here, and would require the preceding preposition to be taken in the impossible sense already noted. It seems better, therefore, to follow the LXX. and other old versions, in regarding the word as a slightly varied mode of spelling the ordinary word for a bow (the final dental letter being exchanged for a cognate dental). The resulting meaning is deeply coloured by sad irony. "Thou hast indeed given a banner--but it was a signal for flight rather than for gathering round." Such seems the best view of this difficult verse; but it is not free from objection. "Those who fear Thee" is not a fitting designation for persons who were thus scattered in flight by God, even if it is taken as simply a synonym for the nation. We have to make choice between two incongruities. If we adopt the favourite view, that the verse continues the description of calamity, the name given to the sufferers is strange. If we take the other, that it describes God's gracious rallying of the fugitives, we are confronted with a violent interruption of the tone of feeling in this first part of the psalm. Perowne accepts the rendering from before the bow, but takes the verb in the sense of mustering round, so making the banner to be a rallying-point, and the giving of it a Divine mercy. The second part (vv. 5-8) begins with a verse which Delitzsch and others regard as really connected, notwithstanding the Selah at the end ver. 4, with the preceding. But it is quite intelligible as independent, and is in its place as the introduction to the Divine Oracle which follows, and makes the kernel of the psalm. There is beautiful strength of confidence in the psalmist's regarding the beaten, scattered people as still God's "darlings." He appeals to Him to answer, in order that a result so accordant with God's heart as the deliverance of His beloved ones may be secured. And the prayer has no sooner passed his lips than he hears the thunderous response, "God has spoken in His holiness." That infinite elevation of His nature above creatures is the pledge of the fulfilment of His word. 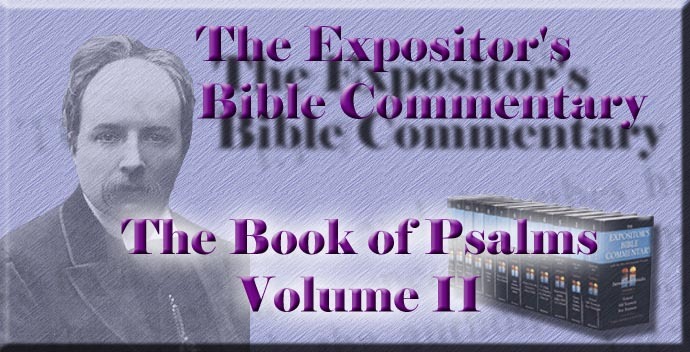 The following verses contain the substance of the Oracle; but it is too daring to suppose that they reproduce its words; for "I will exult" can scarcely be reverently put into the mouth of God. The substance of the whole is a twofold promise--of a united Israel, and a submissive heathendom. Shechem on the west and Succoth on the east of Jordan, Gilead and Manasseh on the east, and Ephraim and Judah on the west, are the possession of the speaker, whether he is king or representative of the nation. No trace of a separation of the kingdoms is here. Ephraim, the strongest tribe of the northern kingdom, is the "strength of my head," the helmet, or perhaps with allusion to the horns of an animal as symbols of offensive weapons. Judah is the ruling tribe, the commander's baton, or possibly "lawgiver," as in Gen. xlix. Israel thus compact together may count on conquests over hereditary foes. Their defeat is foretold in contemptuous images. The basin for washing the feet was "a vessel unto dishonour"; and, in Israel's great house, no higher function for his ancestral enemy, when conquered, would be found. The meaning of casting the shoe upon or over Edom is doubtful. It may be a symbol for taking possession of property, though that lacks confirmation; or Edom may be regarded as the household slave to whom the master's shoes are thrown when taken off; or, better, in accordance with the preceding reference to Moab, Edom may be regarded as part of the master's house or furniture. The one was the basin for his feet; the other, the corner where he kept his sandals. If the text of ver. 8 c is correct, Philistia is addressed with bitter sarcasm, and bidden to repeat her ancient shouts of triumph over Israel now, if she can. But the edition of these verses in Psalm cviii. gives a more natural reading, which may be adopted here: "Over Philistia will I shout aloud." The third part (vv. 9-12) is taken by some commentators to breathe the same spirit as the first part. Cheyne, for instance, speaks of it as a "relapse into despondency," whilst others more truly hear in it the tones of rekindled trust. In ver. 9 there is a remarkable change of tense from "Who will bring?" in the first clause, to "Who has guided?" in the second. This is best explained by the supposition that some victory over Edom had preceded the psalm, which is regarded by the singer as a guarantee of success in his assault of "the fenced city," probably Petra. There is no need to supplement ver. 10, so as to read, "Wilt not Thou, O God, which," etc. The psalmist recurs to his earlier lament, not as if he thought that it still held true, but just because it does not. It explained the reason of past disasters; and, being now reversed by the Divine Oracle, becomes the basis of the prayer which follows. It is as if he had said, "We were defeated because Thou didst cast us off. Now help as Thou hast promised, and we shall do deeds of valour." It is impossible to suppose that the result of the Divine answer which makes the very heart of the psalm, should be a hopeless repetition of the initial despondency. Rather glad faith acknowledges past weakness and traces past failures to self-caused abandonment by a loving God, who let His people be worsted that they might learn who was their strength, and ever goes forth with those who go forth to war with the consciousness that all help but His is vain, and with the hope that in Him even their weakness shall do deeds of prowess. "Hast not Thou cast us off?" may be the utterance of despair; but it may also be that of assured confidence, and the basis of a prayer that will be answered by God's present help.